We are a leading Manufacturer of case packing machinery from Mumbai, India. 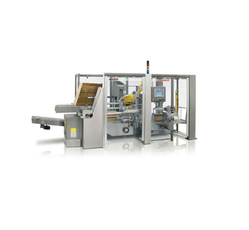 We are actively engaged in offering a qualitative gamut of Automatic Case Packer Machine. Module M2 (Matrix Conveyor): The bottles move forward to M2 through diverter onto Matrix conveyor. The matrix of (4x5=20 bottles) will be formed on this conveyor. Module M3 (carton infeed): Formed cartons will be move on this conveyor of 2.4mtr long Belt Conveyor. Module M4 (case packer): The Matrix of bottles from Matrix conveyor are picked up and placed inside empty cartons at the case packer junction. The pickup of bottles will be made by a specially designed Grippers to ensure that every bottle from the matrix is picked-up. Looking for Case Packing ?